Glenview Haus now accommodates commercial clientele an expansive collection of Specialty Doors. 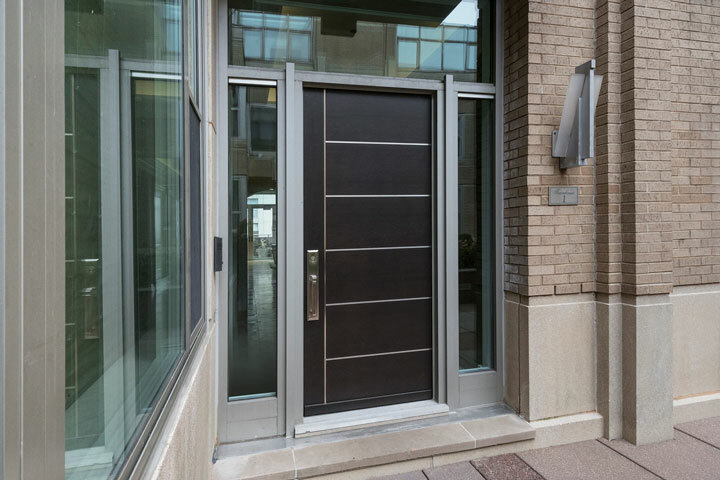 Including historical renovation and other modern designs for commercial offices and buildings, Glenview Haus's solid wood entry doors use the latest technology to ensure duration and style. Fire-rated entry doors ensure the maximum protection in case of fire for any business or commercial enterprise. Like all Glenview Haus wood entry and interior doors, Specialty Doors can be customized in countless ways to fit the design of the building and the vision of our clients. Whether it is intricate carvings reminiscent of an era long ago, or a more simplistic, modern design, Glenview Haus is able to help clients create their perfect door. Glenview Haus’ Historical Renovated Doors are designed to transport guests to another era while being built with modern technology. The team at Glenview Haus studies the original design of the door and works with you to recreate all of the unique details that initially adorned the door. They can replicate exact panel and sticking profiles no matter how complex and intricate, to ensure the aesthetic design is an exact match and meets the client’s needs. Historically Renovated Doors are redesigned with current technology and furniture-quality wood, so they have improved insulation qualities and can better endure the elements. Glenview Haus is also able to make historically renovated doors fire-rated to ensure the utmost protection of the building and its occupants while meeting compliance and local building codes. 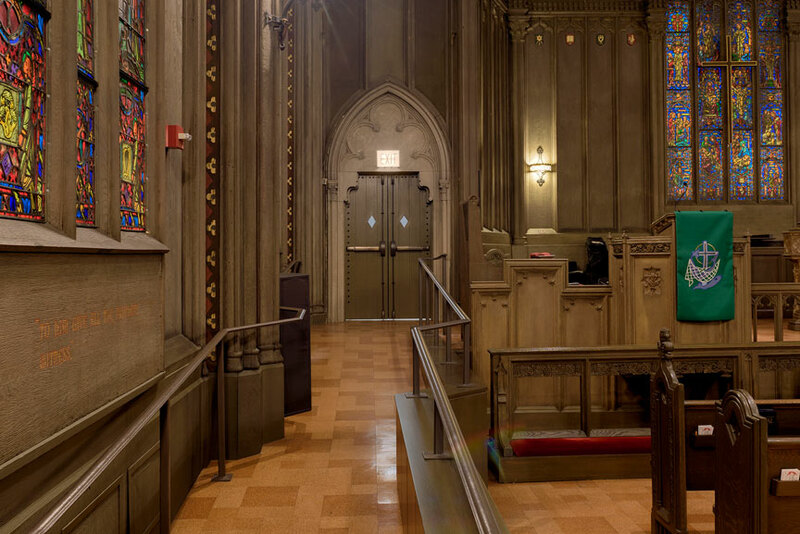 Recently, Glenview Haus finished restoring the wooden doors for Chicago Temple First United Methodist Church, also known as First Methodist Episcopal Church. This landmark building was completed in the year 1923, and at the time was the largest building in Chicago. Glenview Haus was able to reproduce the features of the door unique to its time-period, such as the wrought-iron clavos and ornamental decorative hardware. This historical renovation project is only one example of Glenview Haus’ ability to recreate the past in the present. Focused on making sure that their Historically Renovated Doors are made with the highest quality construction techniques, Glenview Haus engineers the doors in two ways that add durability and stability. Glenview Haus’ solid wood historically renovated doors are crafted from the world’s finest hardwoods. The premium grade components of these doors are first kiln dried, and then craftsmen carefully match grain textures and colors to craft a beautiful wood door. Additionally, Glenview Haus’ manufacturing capabilities allow for the application of a European method of construction to historically renovated doors. The European construction doors are based on the door sandwich design. This means that furniture-grade wooden veneers cover a thermal insulation board with aluminum elements for added stability. This construction method delivers an excellent thermal performance and overall product durability so that your historical renovation and landmark projects will stand the test of time and last for years to come. Businesses looking to enhance customer experience with a unique entry door, will find countless options with Glenview Haus’ Commercial Doors. Glenview Haus helps you design your dream space by offering customizable, made-to-order doors that will blow away any visitor. Our team will help you forget the average doors that can appear in stores, offices and hotels and introduce you to our distinctive interior and entry door designs that raise ordinary to extraordinary. 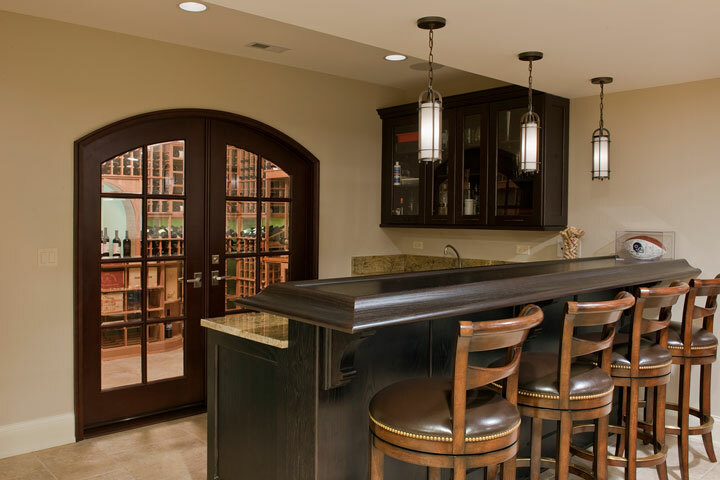 Whether it is an upscale boutique or a high-end restaurant in a metro area, Glenview Haus helps business owners design different, stylized doors fit to impress. Glenview Haus craftsman doors can be customized to have intricate carvings or elaborate paneling. Recently, Glenview Haus finished a bed and breakfast project where they installed gorgeous barn doors to separate the kitchen from dining area. Glenview Haus is able to provide doors ranging in many styles. From flush and mid-century modern wood doors, to fire-rated glass doors Glenview Haus offers endless options for your commercial space. No matter if it is hospitality and high-end multi-family projects or healthcare and educational institutions, Glenview Haus creates customizable entry and interior doors available in the highest quality wood species, glasses and resins that will help turn your commercial space into a thriving area for commerce, productivity and luxury. Clients looking for TruStile paint-grade MDF interior doors for their commercial spaces can find them at Glenview Haus. TruStile doors are created with the preferred painted application method, and are built to last. Commercial projects needing trendy and stylistic details will be satisfied with TruStile’s use of leather or mirror inserts, an incredible selection of wood species and resins, and numerous panel and sticking profiles. Glenview Haus’ partnership with TruStile creates unlimited choices for clients wishing to spice up their commercial space. Focused on making sure that our commercial doors are made with the highest quality construction techniques, Glenview Haus engineers the doors in two ways that add durability and stability. Glenview Haus’ solid wood commercial doors are crafted from the world’s finest hardwoods. The premium grade components of these doors are first kiln dried, and then craftsmen carefully match grain textures and colors to craft a beautiful wood door. Additionally, Glenview Haus’ manufacturing capabilities allow for the application of a European method of construction to historically renovated doors. The European construction doors are based on the door sandwich design. This means that furniture-grade wooden veneers cover a thermal insulation board with aluminum elements for added stability. This construction method delivers an excellent thermal performance and overall product durability so that your historical renovation and landmark projects will stand the test of time and last for years to come. Glenview Haus offers clients fire-rated doors to ensure the maximum protection in case of fire for any business or commercial enterprise. Our fire-rated doors are completely custom made and architectural grade, while being officially certified and rated up to 90 minutes. These doors provide a perfect combination of safety and style, allowing a clean, consistent look with all the same details as the rest of the doors throughout the building. 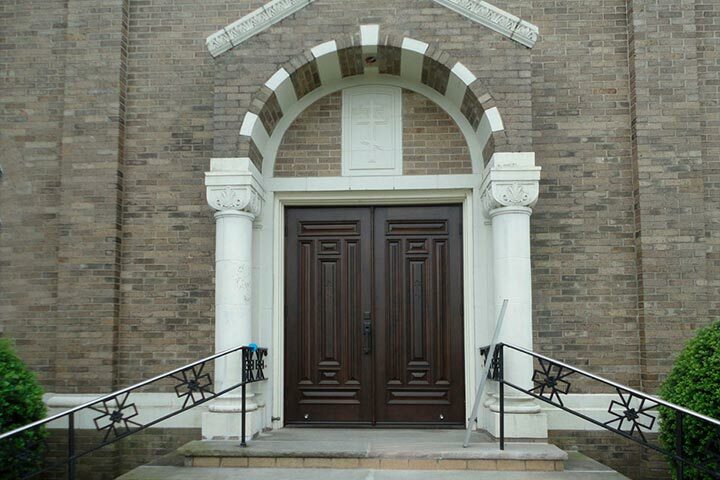 From replacing extremely elaborate doors in a landmark hotel to providing a custom designed church entryway, our fire-rated doors are perfect for historical restorations, landmark projects, religious organizations, high-end commercial and hospitality establishments and all other areas where a simple flush metal door will not do the job justice. We produce fire-rated doors to meet your exact specifications, while ensuring furniture grade quality and artisan craftsmanship. The ability to match distinct designs, produce custom sizes, and choose from a variety of wood species and unlimited finishes will make sure that your custom made Fire-Rated Doors will be exactly what you are looking for. By using a fire-rated core in the Fire-Rated Door manufacturing process, we can custom make units that are rated 20, 45, 60 and 90 minutes. 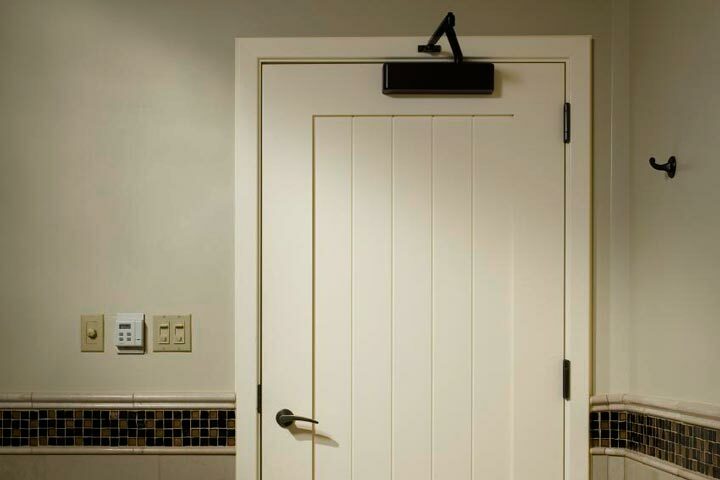 Instead of being stuck with hollow metal frames for rated applications, our process also allows the jamb to be rated so as to provide an entire entry system that will completely match all other doors in terms of wood species, design and finish. Glenview Haus offers rated glass and glazing options for rated doors as well to let in light but still keep people safe and meet code. By using a fire-rated core in the Fire-Rated Door manufacturing process, we can custom make units that are rated 20, 45, 60 and 90 minutes. Instead of being stuck with hollow metal frames for rated applications, our process also allows the jamb to be rated so as to provide an entire entry system that will completely match all other doors in terms of wood species, design and finish. Glenview Haus offers rated glass and glazing options for doors that let in light and also are designed to keep people safe. We can machine for all hardware including hinges, locks, closers and other rated hardware that is specified by our clients. Custom wrought-iron decorative elements are also available on request. Glenview Haus’ Fire-Rated Doors don’t make you compromise style for fire safety. With our many customization options, your commercial space will be as beautiful as you dreamed.